Canned chipotle chiles in adobo provide both heat and a rich smokey flavor. Find them in well-stocked supermarkets or in Hispanic groceries. Any leftover chipotles can be frozen for future use. Sort and rinse beans. Add 2 quarts water (if possible, do not use very hard water-- this could prevent beans from softening) and let stand overnight, or use quick-soak method: boil beans in 2 quarts water for 2 minutes, cover, and let stand 1 hour. Return beans and soaking water to medium heat. In a saucepan or skillet, heat oil. Add chopped onion and cook, stirring occasionally, for 5 minutes. Add garlic and cook another minute or two. Add to beans. Add chipotles, chili powder, salt, ketchup, and tomatoes to beans. 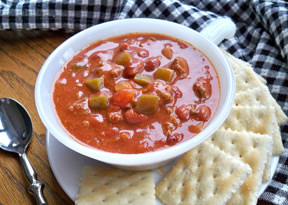 Adjust heat to maintain a simmer and cook until beans are tender, 1 1/2 - 2 hours. Taste for seasoning. 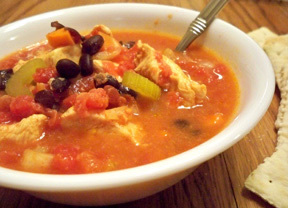 Top, if desired, with any or all of: sour cream, chopped fresh cilantro, grated cheese. 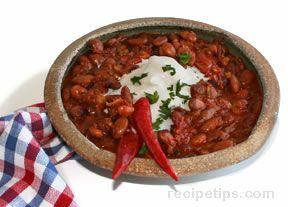 TIP: Allow plenty of time for beans to cook - old beans take longer.